During these hot summer evenings, my wife and I love to bike around Beijing’s hutongs. On every street corner and in every park, generations of families, friends and neighbors dance en masse, sing along to a classic tune, and chat away while walking — often backwards. This happens every night in every season — in every town and city across all of China. Every so often my wife will drag me into that happy group of dancers, my two left feet ruining her graceful moves, but we love the charm and warmth of it all. I already know that whenever I move from China and look back upon my many years here, these moments will stand out. I mention all this because as an American expat straddling two cultures, I inevitably compare the strengths and weaknesses of each. Of course I confess a bias towards an American viewpoint. But I am perfectly comfortable saying that the average Chinese person is healthier than the average American. And I think Americans could learn a few health tips from China. Perhaps my readers may find that laughable! But after seven years of observations, I truly feel that it is true. I say this especially since my trip last year back to the east coast of America. It’s no secret that obesity in America is a serious health problem, with the majority overweight and more than one third obese. But last fall I was viscerally struck to see this in person. I kept thinking of the Pixar movie WALL-E, where in the near future mankind becomes so obese that no one walks anymore, spending every hour comfortably in their self-driven hovercraft as robots feed, clothe and bathe them. That’s supposed to be hundreds of years in the future, but Pixar’s gloomy vision of future America certainly seems prescient. In China, it’s still quite rare to see obese people on the streets. This is changing recently, especially among children as families spoil their little emperors. But in general it’s still not common to be overweight in China. Data from the WHO shows an obesity rate of 32% in the USA and only 6% in China, and an overweight rate of 25% in China but a mind-boggling 69% in the USA. Diet differences are a major factor, but another major reason is that people in China move around a lot more, getting their “exercise” just from everyday routines. Clearly the evening culture plays a major role in this healthy activity. It’s such an ingrained part of Chinese culture that there’s a famous old proverb 饭后百步走，活到九十九 (take a hundred steps after eating, live to be 99). There’s simply nothing like this social nightlife in America, and it’s a wonderful cultural tradition which I deeply wish we had in America. Even in enlightened and active San Francisco, there may be a few people walking their pets or jogging after dinner, but otherwise our American sidewalks are mostly empty at night. It’s a real shame because such daily activity can dramatically decrease your risk for heart disease, the world’s number one killer. A large 2012 study involving over 400,000 people confirms again that even only 15 minutes a day or 90 minutes a week of moderate exercise can reduce your risk of death by 14% and increase life expectancy by three years. A routine 20 minute brisk walk after dinner automatically gets you to that recommended 150 minutes a week of moderate exercise. Just have your nightly walk plus a daily bike commute and you have no need for that gym membership or that treadmill machine you picked up at a yard sale years ago but never use! Besides the clear differences in weight and daily activity, the average Chinese person has a much healthier concept of nutrition and wellness than the average American. Many Americans are famously healthy with their fruit smoothies, organic supermarkets and extreme workouts. But that percentage of super healthy Americans is easily outmatched by the much more numerous obese, inactive Americans eating large portions and fast food. There’s a great dichotomy of wellness in America! But in China, I’ve noticed that people both rich and poor, from the countryside and the cities have an equally extensive knowledge about which foods are good for each season, which foods help keep you healthy and which help when you’re sick. Chinese also eat many more vegetable dishes with each meal than in America. Much of all this involves traditional Chinese medicine concepts of balance, yin and yang, and hot and cold. And while I am skeptical of many of the specific medical claims of TCM, certainly the underlying concept of balance is a very powerful philosophy to underline anyone’s approach not just to their diet choices but their entire life. This ingrained Chinese concept of balance regarding foods is far more successfully integrated into people’s mindsets than the American approach. Americans also use the word balance when discussing a balanced diet, but that discussion clearly has failed to be internalized in the culture. So we tried the food pyramid for a while and that didn’t resonate, and now it’s the “MyPlate” campaign. American magazines and bookshelves are filled with health fads and diets that come and go, while the obesity rate and diabetes cases continue to skyrocket. Clearly all this American chatter about health and wellness is completely failing. There is something fundamentally wrong with our current culture’s lifestyle and philosophy of wellness which is hurtling most citizens backwards. But what about the sorry state of food safety in China, or the massively polluted air and water? How about how the US towers above China in life expectancy, as well as in the World Happiness Report? How can Chinese men be healthier when over half of them smoke? These are valid counterpoints, but I argue that these are short term problems. Thirty or forty years ago American men smoked just as much as Chinese men, but after public education campaigns the rate is now much lower (but still too high). Regarding happiness, the number one factor is income, and China’s average income is still a small fraction of the average American. And while the World Values Survey also noted more happiness in Americans, more Chinese felt their state of health was good. And with the environment, China is going through the same pattern of self destruction as every other industrialized Western country did — and there’s no reason not to assume it will clean up just as well, in time. Let’s assume that in a couple decades these obvious environmental and social differences will be improved, along with economic parity. What will we see? Will we see China’s obesity rate also catch up to the west? I think not. Actually, I prefer to think not. I would like to be an idealist and say that even with economic parity, Chinese will still preserve their concepts of wellness and balance, still eat their vegetables even if surrounded by KFC and Starbucks. And I hope more than anything that both American and Chinese streets will be filled at night with singing and dancing. Previous PostVaccines For Expats in China: The BasicsNext PostFinally, Great Data on Air Purifiers in China! The author does go on say this is his preferred vision of the future, but I think he is ignoring many facts (and just looking at the facts that support his vision) and making bad assumptions. 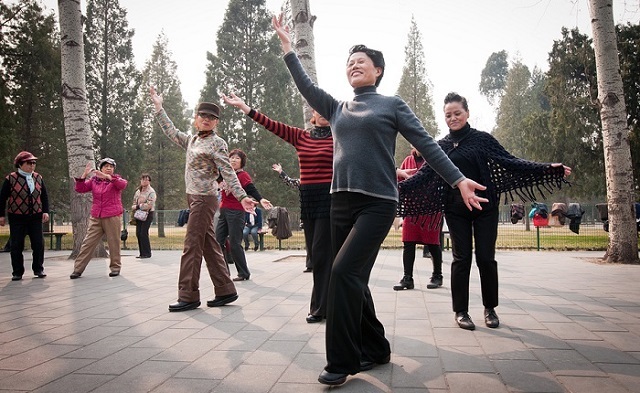 The Chinese that ‘exercise’ after dinner (and also do morning routines in the park) are 99% elderly. What he describes is the culture of bygone days in China. And in the bygone days, everyone cooked at home and they ate lots of vegetables … so today’s younger generation is familiar with some of this. But if you actually look at what the Chinese in their 20’s and 30’s are eating, it is not so healthy. Less vegetables, more meat. Less good stuff and more fast food and pre-packaged items. In the old days, most food was bought at the cai shi chang (vegetable market). These still exist today, but you should see all the people going to supermarkets. And if you look in the supermarkets, they look just like the American supermarkets — aisle after aisle of mass produced junk (cookies, crackers, candies, factory made dumplings, mountains of cooking oil sold in 3 liter jugs, and enough instant noodles to feed an army). Cooking methods – everything is fried in a lot of oil, so high calories and studies have shown that it is not good to get too many calories from vegetable-based oils/fat. Also .. extreme over-usage of salt and MSG. Are too many Americans overweight and living unhealthy lifestyles? YES. Are the Chinese healthier? Difficult to say, but the trend is not good. So it is highly likely that the Chinese will get less healthy over the next generation or two. PS – author writes “Besides the clear differences in weight … ” Just wanted to share something on this. Yes, there are really fat Americans. However, I think quite a few of Chinese middle aged or elderly also have unhealthy weights, but it is less noticeable since they are short. I don’t mean this negatively, but a tall person who is overweight comes across as this huge person, but a short person who is stocky is often still described as small. But if you were to see that short person in their underwear (or maybe just saw their underwear hanging to dry), you would be surprised at the waist size of this ‘small’ person. I have seen countless cases of this. Thanks for the thoughtful reply. I do agree that the situation in China is “deteriorating” which is what I had mentioned. But I still think there are better fundamentals of culture which will prevent them from 100% going the American path. Also, I don’t agree that 99% of people exercising at night are elderly. It’s true that few are in their 20’s but plenty are 30’s, etc. What is concerning is that the vast majority of the exercisers are women, while the men are singing or just playing cards and smoking with their friends. Obesity in China will definitely rise. Diet choices start early in life and affect our lifelong health (via gut health, “good” bacteria promulgation vs bad). How many tiny children I see who are clearly in trouble weight-wise, already, waddling down the street with chemically “ice cream” thingies on sticks?! Every. Day. Obesity risk can start earlier than this. It also relies on PARENTS’ choices. I’m talking about Breastfeeding. Artificial milk product sales are booming, and milk powder is about 50% corn syrup solids. Less “modern” city women overall in China are even breastfeeding part time and over time we will see higher rates of obesity.